COLUMN DESIGN: Authentic Replication wood columns. Plain, tapered shaft. Round Tuscan capitals, and round Tuscan base moldings / plinths. PROJECT COMMENTS: Chadsworth Columns specializes in creating custom columns, based on the required specifications of your project. 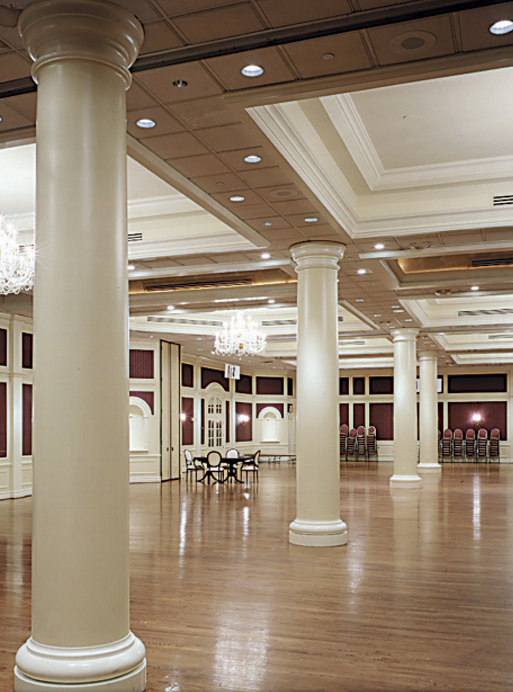 These columns were made with rounded-off Tuscan capitals and rounded-off Tuscan base moldings / plinths. Our columns are showcased inside the United Talmudical Academy School in a multi-purpose room. There were (5) of our Colossal custom wood columns used in this project. This entry was posted in Educational Developments and tagged Authentic Replication Wood Columns, brooklyn new york, chadsworth columns, custom round columns, custom wood columns, educational developments chadsworth columns, paint-grade wood columns, united talmudical academy school by Chadsworth Columns. Bookmark the permalink.